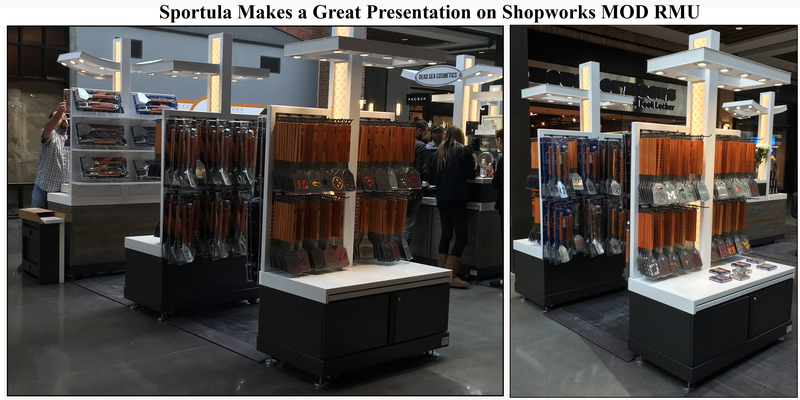 Shopworks’ president, Sharon Loeff, has once again demonstrated her capacity for design innovation with the first installation of the MOD retail merchandising units. Ms. Loeff created the MOD design for the standard product line of GST Retail, Shopworks Haltom, TX based manufacturing partner. 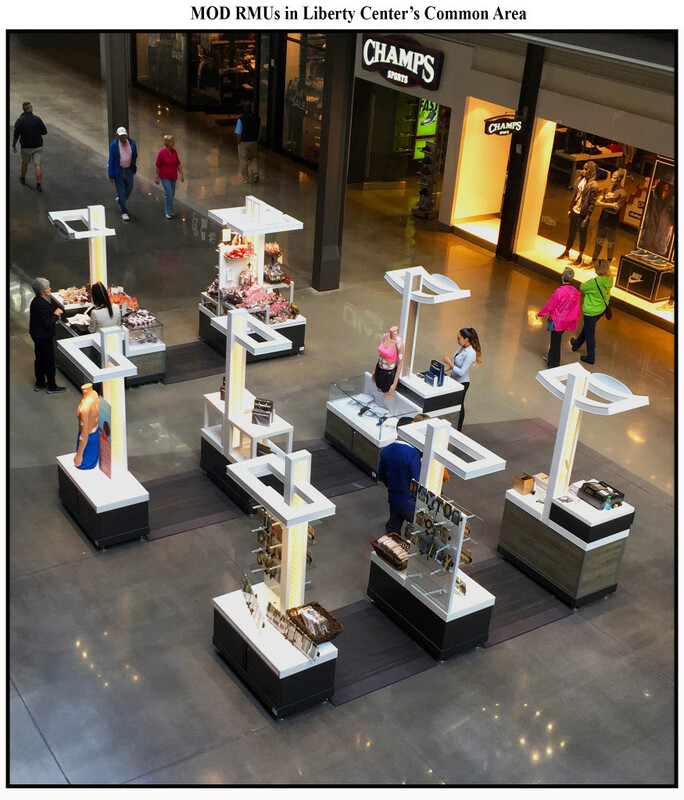 Steiner and Associates of Columbus, OH selected these remarkable fixtures for the common area at its newest lifestyle property; Liberty Center in Cincinnati, OH. The MOD RMU consists of four distinct components: a primary unit, two secondary units, a lighted glass display case, and a cash wrap. The MOD’s standard configuration is as a 4’ x 8’ RMU. 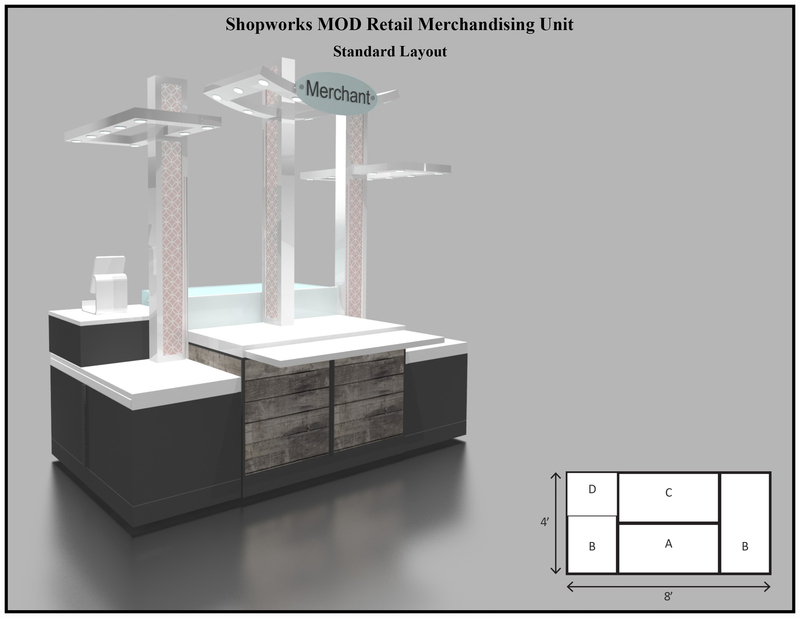 The genius of the MOD is that its components can be arranged in a nearly infinite number of configurations to suit specific merchandising needs and retail presentations. In fact, there are so many ways to combine the MOD’s components that merchants have come to think of it as the Transformer of RMUs. The MOD RMUs played an important part of the center’s grand opening on October 22. They provide this space with a unique look and feel that is distinctly different than the traditional, cookie-cutter placement of an RMU, or kiosk every ten to twenty feet down the middle of the common area. The common area at Liberty is sixty feet at its widest point; considerably wider than most. This allows for the location of RMUs both laterally as well as along the central, long axis of the space. The common area program managers at Liberty Center exploited this extra width by taking advantage of the MOD’s unique flexibility, which allows the components to be separated and extended; in this case laterally. The result; a much more open and accessible feel for both the program as a whole, and each individual retail concept. Mr. David Tapero who operates two different retail uses at Liberty Center, Wheeli Scooters and Smart Massagers, commented that, “the MOD works almost like a kiosk and brings more chic to the product”. The arrangement of the MOD’s components is driven by how to best present a retail concept. 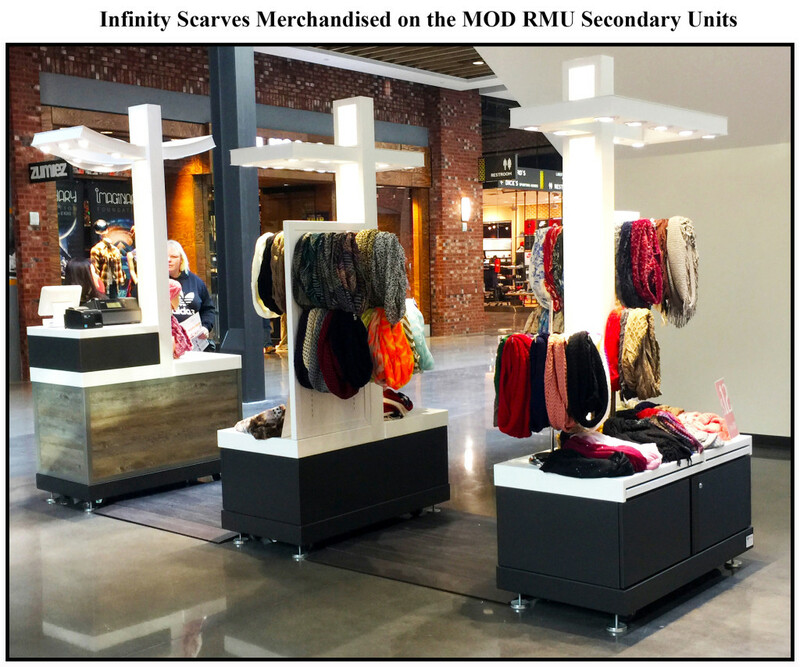 Infinity Scarves, shown below, used the MOD’s two secondary units in combination with double-sided slatwall and display hooks. The primary unit was reserved for POS transactions. In between each component of the MOD is a foot friendly and ADA compliant sub-floor. In addition to creating a visual connection between each MOD component, the sub-floor provides a trip proof chase-way for power and data connections. Ruby’s Chocolates needed to maximize the continuous display area for their presentation. To accomplish that, the MOD’s two secondary units were placed back-to-back creating one, larger unit. Staggered pedestals, charming animal fixtures, and rustic wire baskets were used as secondary fixtures to complete the look. 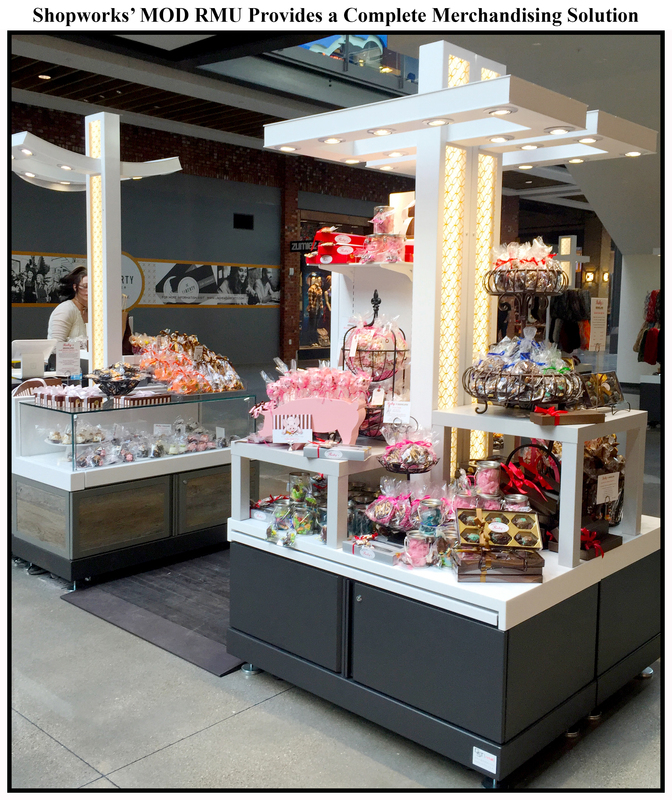 Not only do these units provide ample merchandising real estate, but the combined storage space in the bases is equivalent to a large RMU. The MOD’s glass display case was abutted to the primary unit to create the store’s second station. 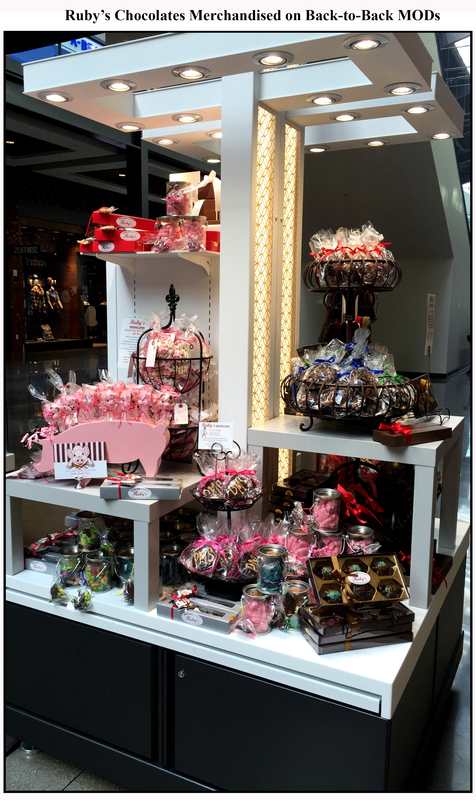 The primary unit is used for POS while the glass display case presents the brand’s more fragile confections, menu signage, and gift box collections. 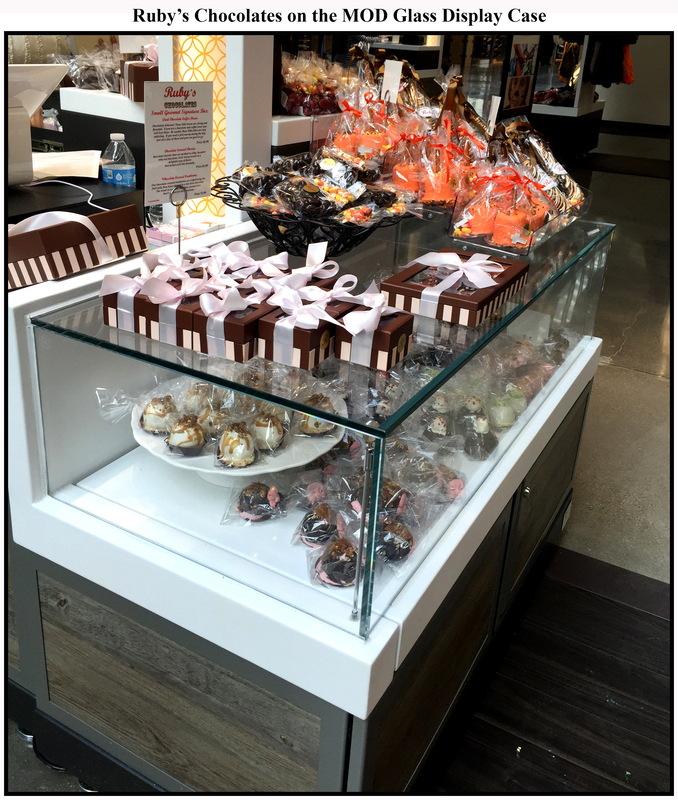 From afar, the Ruby’s Chocolates concept on the MOD RMUs is open, inviting, and friendly. The sales staff can easily monitor and service all interested customers from the POS station thereby reducing fatigue and shortage. The new Sportula product line shows very well on the MOD. The amount of inventory that can be displayed is really impressive. Even very large items such as these hover boards are easily accommodated on the MOD RMU. 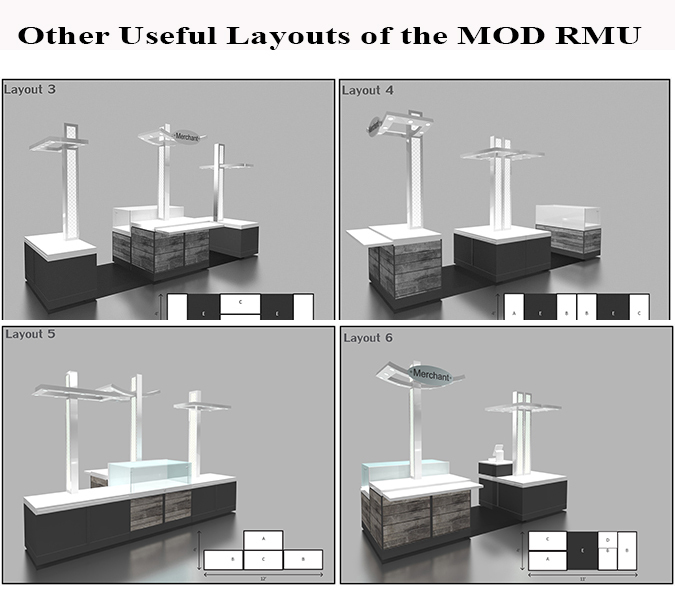 Below are examples of other useful configurations of the MOD RMU.